Visiting a theme park can be an overwhelming experience, especially if it’s your first time there. The most efficient ways to navigate around a park aren't always obvious, and sometimes following the crowd isn't the best idea. 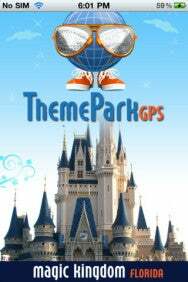 ThemePark Guides has released ThemePark GPS Magic Kingdom-Orlando, an app that helps you find your way around the Magic Kingdom theme park within Walt Disney World Resort. There are several apps available that help you navigate Disney World (as well as other resorts, including California's Disneyland), but this app adds the twist of providing voice-guided turn-by-turn navigation through the park. It also offers walking route maps and provides information about different attractions, restaurants, and other points of interest. Another handy feature is the ability to locate other friends or family members who are using the app on their own iOS device, much like Apple’s Find My Friends app. The Family & Friend Tracker function even includes in-app messaging of those other users. And you can even use the app to help find your car in the parking lot at the end of the day. ThemePark GPS Magic Kingdom-Orlando is available now on the iTunes App Store for $1; it requires a device running iOS 3.2 or later. A separate app provides similar data for the Six Flags over Texas park.